Get positive suggestions for practical solutions to this heated issue. Hotly debated in the political arena and splashed across the media almost 24/7, global warming has become the topic of the moment. Whatever one's views on its cause, there is no denying that the earth's climate is changing, and people everywhere are worried. Global Warming For Dummies sorts out fact from fiction, explaining the science behind climate change and examining the possible long-term effects of a warmer planet. This no-nonsense yet friendly guide helps you explore solutions to this challenging problem, from what governments and industry can do to what you can do at home and how to get involved. Elizabeth May is the leader of the Green Party of Canada. Dr. May is a lawyer and the author of six books on Canadian environmental issues. She has been recognized twice by the United Nations for her work in the environmental movement. Zoe Caron serves on the Board of Directors of the Sierra Club of Canada. She works with Students on Ice Expeditions, bringing students from around the world to the Arctic and Antarctic to learn about the importance of these regions. Part I: Understanding Global Warming. 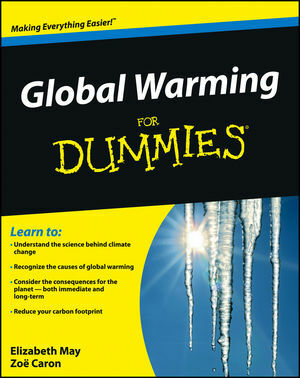 Chapter 1: Global Warming Basics. Chapter 2: The Greenhouse We Live In. Chapter 3: The Big Deal About Carbon. Part II: Tracking Down the Causes. Chapter 4: Living in the Dark Ages of Fossil Fuels. Chapter 5: Getting Right to the Source: The Big Emitters. Chapter 6: Taking It Personally: Individual Sources of Emissions. Part III: Examining the Effects of Global Warming. Chapter 8: Risking Flora and Fauna: Impacts on Plants and Animals. Chapter 9: Hitting Home: Global Warming's Direct Effect on People. Part IV: Political Progress: Fighting Global Warming Nationally and Internationally. Chapter 10 : Voting for Your Future: What Governments Can Do. Chapter 11: Beyond Borders: Progress on a Global Level. Chapter 12: Developing in the Face of Global Warming. Part V: Solving the Problem. Chapter 13: A Whole New World of Energy. Chapter 14: Show Me the Money: Business and Industrial Solutions. Chapter 15: Activists without Borders: Non-Governmental Organizations. Chapter 16: Lights, Camera, Action: The Media and Global Warming. Chapter 17: Taking the High Road. Chapter 18: Making a Difference at Home and Work. Chapter 19: Ten Things You Can Do Today to Slow Global Warming. Chapter 20: Ten Inspiring Leaders in the Fight Against Global Warming. Chapter 21: Top Ten Myths about Global Warming. Chapter 22: Ten Online Global Warming Resources.